Dr. Carlos J. Huerta's ingenuity and talent has transformed the lives of his clients and their health. charismatic linguaphile explores the world, builds connections, and creates smiles beneath his infectious laughter. With a background and continued hobby in the arts, Dr. Huerta’s talent adds to his creative approaches to cosmetic dental treatment and to his ingenuity in effecting not only physical stability in the environment but also in using light and shadow and other nuances to create the illusion of ideal aesthetics with minimal alteration to healthy tooth structure. Having an undergraduate major in humanities, Dr. Huerta also has lived abroad and has continued to feed his interest in learning about diverse cultures and languages, continually increasing his understanding of the human element in dental treatment, contributing more every day to his already amazing relationship with his patients. 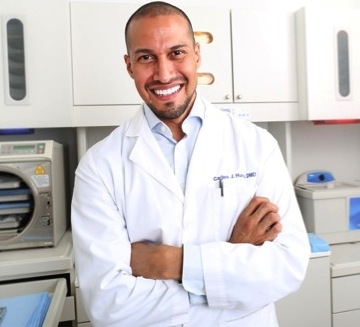 Since his move to New York in 2005, Dr. Huerta has expanded his training to include Invisalign orthodontic treatment and perioral therapeutic and cosmetic treatments with Botox and dermal fillers (e.g. Juvéderm) and continues to stay current with cosmetic dental procedures and whitening systems.